It’s becoming a familiar pattern this season on the road. Last night’s 1-0 defeat at West Ham was our sixth away defeat in seven and we’ve still failed to score a solitary goal other than the penalty at Southampton when we were already 3-0 down. This latest defeat came courtesy of a debatable penalty decision on the stroke of half time but this time we could and probably should have come back during a second half where we certainly had opportunities with one very good chance to equalise. Unfortunately we didn’t take one, lost again on what was a long day out to watch us at a ground that was almost like the Withdean with stands. Everything was going well for the most part going down. We’d taken message board advice to drive to Epping and, after a stop at one of our favoured destinations just off the M1, it was all plain sailing for an early arrival until we hit the M25. From there it was a crawl. We got to the station to learn that trains were delayed due to a police matter and when we finally reached Stratford we were faced with a walk of certainly over half an hour before reaching the stadium. We’d expected to be there at around 6:15 but it was close to 7:40 when we finally got inside. I’d been hoping we would get allocated seats in the upper tier but alas they weren’t. When I took a look inside I was relieved. I’m sure the seats in the upper tier were high enough but they were so far away I think they might have had a better view of the Spurs v Hull game. Burnley, showing one change from the team that had beaten Bournemouth with Andre Gray replacing Steven Defour, played in last season’s yellow kit, with Dafabet duly added, but it was the off field activities that dominated the early exchanges. “Can you sit down?” one burly steward said to me. Now I think everyone knows my feelings on this and knows that I prefer to sit. I’d have been happy to but I was on row 19 with those in front of me on rows 14 to 18 all standing. “No,” was my reply. “I can’t see if I sit down”. He just walked away, ignoring rows 14-15 although one Burnley supporter further down was taken out for apparently refusing to sit while an older couple sat just in front of me were moved to the disabled area to enable them to see the game from a sitting position. It sort of distracted us from the opening minutes of the game but, if the rest of the first half was anything to go by, we didn’t miss too much. But there were more distractions to come. At the far end there was the biggest screen I’ve ever seen at a ground showing the game, but with a slight delay. As hard as you tried, your eyes kept focusing on it whilst actually trying to watch the game. 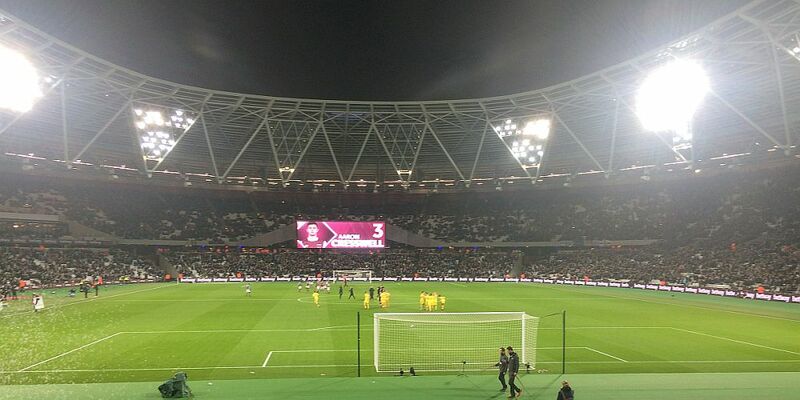 Much of the play was down at the far end to us with West Ham dominating much of the first half. It really wasn’t easy to judge things because of this strange stadium but I think we could count ourselves a little fortunate to get to the 45 minutes with the scores still level. I can’t recall one real effort of note from us, other than a couple of blocked shots, but West Ham hit the woodwork twice, but you could sense the frustration from the home fans as they couldn’t find that elusive first goal. The board went up for two minutes and, just like Saturday when I suggested we needed to hold on to our two goal lead, I said we had to go in level. Almost at the end of the two minutes they won a corner on the right and when it came over it led to Bobby Madley pointing to the spot. I’d no idea why but have since seen it and there is no doubt that there’s a foul by Ben Mee. But Tom Heaton has clearly been fouled. Oh yes, we can talk about over protection of goalkeepers but at least three times last night the referee had shown no hesitation in giving softer ones in favour of West Ham keeper Darren Randolph. I am aware that Sean Dyche will be accused of whinging about it, but the simple fact is that this should have been a free kick to us. A penalty it was though, Noble stepped up but saw Heaton save is spot kick. Tom should probably have done better than to parry it straight back into Noble’s path and, with Madley allowing the game to continue, he made no mistake and we were a goal down at half time. There is absolutely no doubt we were much, much better in the second half. Sam Vokes tried a flick which just went wide, a couple of balls dropped in the box that we couldn’t convert. We won some free kicks against a physical home side, one of which saw Randolph make an outstanding save to deny Scott Arfield. But the closest we came was when Vokes played in Arfield only for him to see Randolph make a superb save. The ball seemed to hit Gray and bounce up for Vokes who looked certain to head home the equaliser only for him to head over the bar with the chance of the match. We threw on Ashley Barnes with a quarter of an hour to go and I’d have liked to see Defour come on too. West Ham were getting frantic, giving free kicks away and with his delivery it would have seen us potentially find some chances. But he didn’t and we didn’t. There was the almost farcical introduction of Patrick Bamford with just over a minute of stoppage time remaining but by then it was all over. West Ham, who had really had just one chance in the half, and that late in the game, saw it out easily and it was another defeat on the road. There’s been the usual overreaction to yet another away defeat. Do I enjoy us losing away like this without scoring? I think everyone knows the answer to that question is a resounding no, but there has to be some reality to it and it’s as if we are in crisis every time we lose. It was a game I thought we could have won and having watched it I do think it is an opportunity lost. The good news is that, West Ham apart, none of the teams below us collected anything more than a defeat which still leaves us in 13th place. I did say that when we do get a good away result it might just come when and where it is least expected – notably the next two games on the road are at Tottenham and Manchester City. Defeated and disappointed we left for the march back to the station. I don’t think I’ve ever seen so many stewards but there were none in sight at one point when there was a chance of it kicking off. Thankfully it didn’t, but I have to report that the problem was very much started by a Burnley supporter. Eventually we made it back to the train, eventually we made it back to Epping to start the long journey home with the first interruption within minutes as we were face with more deer crossing the road than appeared in Bambi. But we made it, although I do have to say that when I could have done with a lie in this morning I did have a dental appointment which I’d made before the game was moved from the Tuesday. It was the 207th different ground I’ve seen Burnley play in. It wasn’t just as bad as I expected in terms of the view but it’s not good, it’s not one I’ll be in a rush to return to. Now to one of my favourite grounds White Hart Lane. Sunday will probably see me make my last visit to this current home of Tottenham Hotspur. At least it’s a football ground. West Ham: Darren Randolph, Cheikhou Kouyaté, Winston Reid, Angelo Ogbonna, Michail Antonio, Mark Noble (Håvard Nordtveit 89), Pedro Obiang, Aaron Cresswell, Manuel Lanzini (André Ayew 69), Dimitri Payet, Andy Carroll (Ashley Fletcher 83). Subs not used: Adrián, Edimilson Fernandes, Domingos Quina, Marcus Browne. Burnley: Tom Heaton, Matt Lowton, Michael Keane, Ben Mee, Stephen Ward, George Boyd (Ashley Barnes 76), Jeff Hendrick, Dean Marney, Scott Arfield (Patrick Bamford 90+4), Sam Vokes, Andre Gray. Subs not used: Paul Robinson, Jon Flanagan, James Tarkowski, Michael Kightly, Steven Defour. Yellow Cards: Ben Mee, Jeff Hendrick.